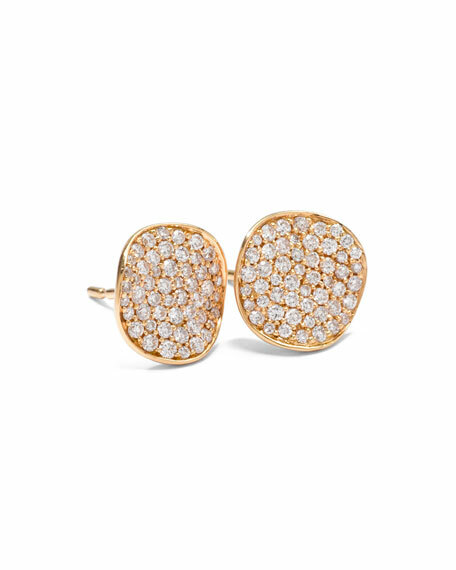 Ippolita crafts these earrings of effulgent yellow gold and radiant white diamonds for contemporary elegance. Armenta stud earrings from the New World Collection. 14-karat gold and blackened sterling silver hardware. Champagne diamond pavé at center. Armenta stud earrings from the New World Collection. 14-karat gold and blackened sterling silver hardware. Champagne diamond pavé at center. 0.17 total diamond carat weight. Approx. 0.2" diameter (6mm). Post backs for pierced ears. Made in USA. Armenta white star stud earrings from the Old World Collection. Polished 18-karat yellow gold with blackened sterling silver. Round disc frame with white enamel as background. Champagne diamond trim and crivelli star center. 0.17 total diamond carat weight. Approx. 0.4" round (9mm). Post backs for pierced ears. Imported. Armenta stud earrings from the Sueno Collection. 18-karat yellow gold hardware and settings. White sapphires and champagne diamonds. Cluster silhouette with crivelli center. 0.09 total diamond carat weight. Post backs for pierced ears. Made in USA. From the Ippolita Stella Collection. Handcrafted sterling silver setting with hammered detail. Round-cut clear quartz over royal. Pave diamond halo, 0.29 total carat weight. Approx. 1/2" diameter (13mm). Post backs. Imported.